Americans go to the polls on Tuesday 6 November for the ‘midterm elections.’ ‘Midterm’ means that these are elections that take place in the middle of the President’s four-year term of office. The last Presidential election took place in November 2016, so we are facing the midterms of the Donald Trump administration. What positions are up for election this November? Congress, the legislature of the United States Federal Government, is divided into two chambers, the House of Representatives and the Senate. The term of office for members of the House of Representatives (called ‘Congressmen’ or ‘Congresswomen’ or in gender-neutral jest ‘Congresscritters’) is two years, so having been elected in November 2016 all 435 seats in the House come up for re-election in November 2018. A House member is elected from a single-member district, like an MP in Britain, and the population of each district is more or less equal. The term of office for the Senate is six years, but the 100 seats in the Senate do not come up in one big block every six years. There are Senate elections every two years but each election is for a third of the Senate. Each state has two Senators, so every two years the majority of states (33 or 34 out of 50) have elections for one of their Senators. There are also elections for public office at state and local level. The most important of these are for Governors, who run the executive branch of government in each of the 50 states, and this is the big year for these elections with 36 out of 50 being decided in 2018. There are also elections in most states for all or part of the state legislature. The state legislature is a mini-Congress which votes on laws that apply only in that state, and nearly all of them (Nebraska is the exception) have a House and a Senate. There are also elections for mayors, city and county councils and individual public offices – famously, there are some places where the office of dogcatcher is elected. What will happen in the elections for the House of Representatives? The Republican Party has controlled the House of Representatives since the 2010 elections and retained a comfortable majority in the 2016 elections with 241 seats to 194 for the Democratic Party. It is normal for the President’s party to suffer losses in midterm elections. The President’s popularity tends to decline in the middle of their term, as it has for Trump, and people who oppose the President are more likely to turn out for the midterm elections. Some voters feel that it is bad for one party to have too much power and that it is better for the House to be a ‘check’ on the power of the President. 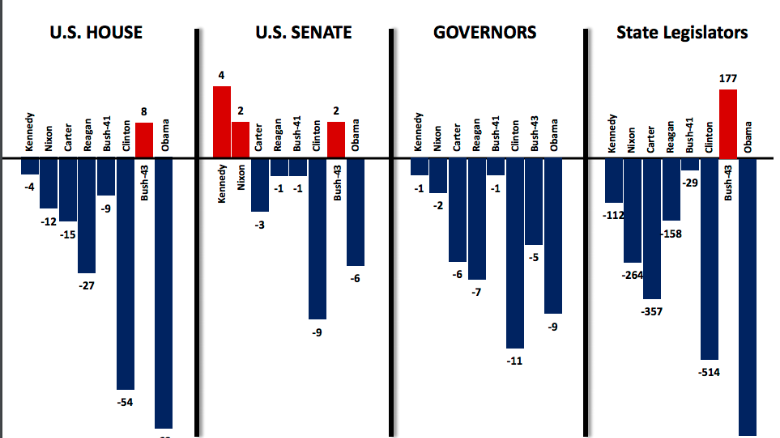 The Democrats lost 13 seats in 2014 and a massive 63 seats in 2010 in President Obama’s two sets of midterms, and the Republicans lost 31 in 2006 in the midterm of George W Bush’s second term. If the Republicans lose 24 seats the Democrats would take control of the House of Representatives. While losses like this are in line with historical precedent, it is not guaranteed and there have been occasions when the President’s party has done better than this, for instance in 1998 and 2002. 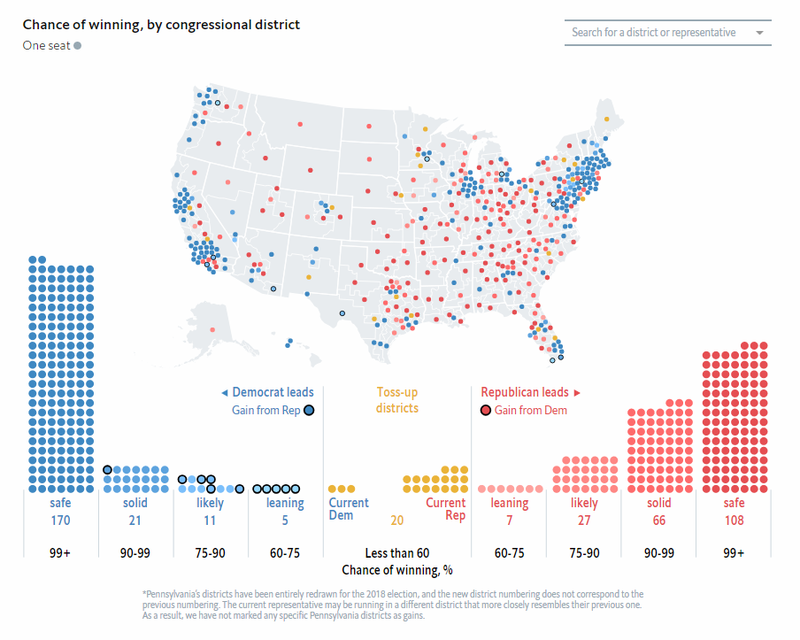 Drawing the boundaries for Congressional districts is very party political and the current map has been deliberately drawn to favour the Republicans, a process called ‘gerrymandering’. The Republicans have their current majority based on a small lead in the popular vote (1 per cent), while the Democrats need to win the vote by a big margin (7-10 percentage points) to win the most seats. The short term of office means that House members are permanently in election mode, and concentrate on raising money to fund expensive election campaigns. What will happen in the elections for the Senate? The Republicans currently have 51 of the 100 seats, with 47 for the Democrats and 2 Independents who tend to vote with the Democrats. The Republican majority in the Senate is much narrower than in the House, but it is probably more secure. This is because these seats last came up for election in 2012 when Obama was being re-elected and the Democrats did well in the Senate elections. They are defending several seats in states where Trump won by big margins in 2016 – North Dakota, Indiana and West Virginia for instance. While people do vote differently in Senate and Presidential elections, and the midterm context helps, these Senators still have a tough task. There are a couple of possible gains (Nevada, Arizona) but nearly everything needs to go right for the Democrats to win control. What will happen in the elections for state governments? These elections depend a lot on local factors. 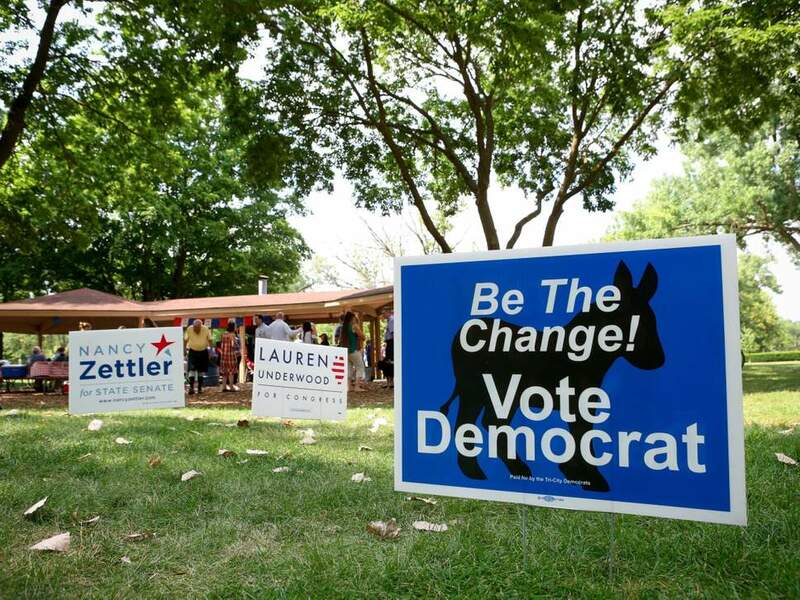 While it helps Democratic candidates to be fighting elections in the midterm of a Republican presidency, the parties sometimes have different images and approaches at state and local level. For instance, the Republican governor of the very Democratic state of Vermont is in no trouble in these elections but the Democrats might manage to win in normally very Republican Kansas. What will the consequences be if the Democrats win? If the Democrats win either house of Congress, then it will become very difficult for Trump to get any controversial legislation past, although other than tax cuts there has not been much legislation even with the Republicans in a majority. In the past Presidents have worked together with Congress when the other party has been in control, for instance in 1996 over welfare reform between President Clinton and the Republican House, and tax cuts in 1981 between President Reagan and the Democratic House. Trump’s style of leadership is unlikely to allow such co-operation. The Republicans have not used the powers of the House or Senate to do much to investigate and scrutinise the way the Trump administration exercises power. 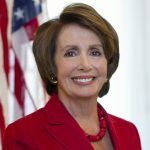 A Democratic House in particular would use its powers to investigate conflicts of interest and other scandals in the executive. A Democratic House would also be open, depending on the results of investigations by Special Counsel Robert Mueller and any other inquiries, to voting for the impeachment (removal from office) of Trump. This would result in a trial in the Senate. The Senate is responsible for confirming the President’s nominations for executive offices (for instance the Secretary of State) and judges. A Democratic Senate would probably stop controversial nominations like Brett Kavanaugh to the Supreme Court and question executive appointments more deeply. Midterm elections: How do they work, when are they and what do they mean for America’s political future?